Just bought a 1997 Iron Horse that says Foes Built on the seat stay. Google has turned up next to nothing. Would like to see pics of complete bike. Any help is appreciated. This is what I have. I have posted in the I/H forum as well. Foes built for Toby Henderson racing for Iron Horse. The same swingarm was used on the LTS and Weasel. Front triangle was IH specific. 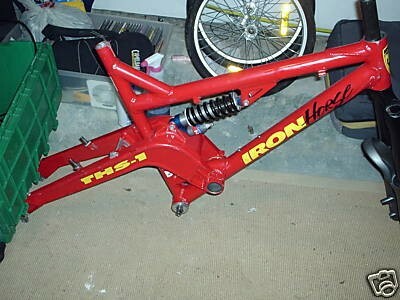 IH didn't build a downhill bike so they enlisted Brent to build one. Very cool piece of MTB history. Last edited by Margaritaman; 03-19-2009 at 05:18 PM. I had the Weasel which was the Foes version of that bike. You can think of it as the Santa Cruze Bullit af few years early; great fun ride. He purchased this bike from one of the Iron Horse guys. It was a team issue for the few guys racing with Toby Henderson in the mid to late 90's. Only a handful of those around. After many years of this frame sitting in the garage and actually changing hands (which is another cool story I will tell) it is finally painted and rolling. Pictures to follow today or tomorrow.